If you want to spend a quiet and pleasant evening, or just escape for some hours the hustle and bustle and the crowds of Taormina, Giardini-Naxos and Letojanni, drive up the coast and go to Sant'Alessio Siculo. The Via di Fuga is located on the waterfront, where you can listen to the sound of the waves and the great background music while having an aperitif or a cold beer - there is a wide selection to choose from - and nibbling on some rustic appetizers. 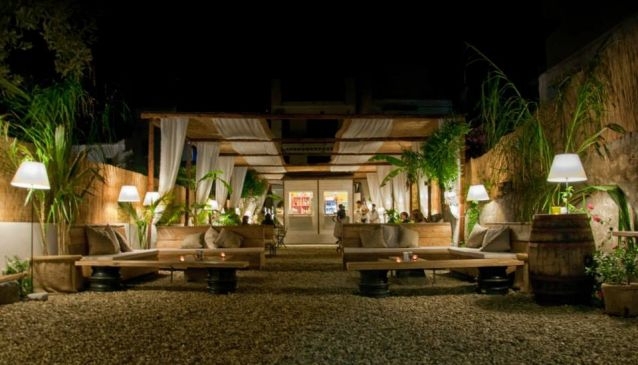 Via di Fuga is a small place where you can relax in style. The atmosphere is homely, the staff very cordial, sandwiches and appetizers are yummy - it is ideal for spending a quiet summer evening or even a romantic evening. We like to hang out from time to time under the trees in the courtyard of the Via di Fuga and enjoy the sea view.